(the only one in the genus, apparently). Does anyone out there have experience with it? 1034A Virginia Street, Berkeley, California 94710-1853, U.S.A.
Arum pictum is superb here and has been hardy so far to 5 degrees F.
>(the only one in the genus, apparently). >Does anyone out there have experience with it? >1034A Virginia Street, Berkeley, California 94710-1853, U.S.A.
Botanic Garden has survived many winters with minimal damage. Arum pictum L. fil. in Suppl. 410 (1782); Engler in A. & C. DC., Monog. corresponding to the missing one. as for A. pictum L. fil. assumed that the type never existed. A. corsicum Loisel., Fl. Gall. (ed. 1) 2: 617 (1807). Type: not designated. FLOWERING PERIOD. October - November. 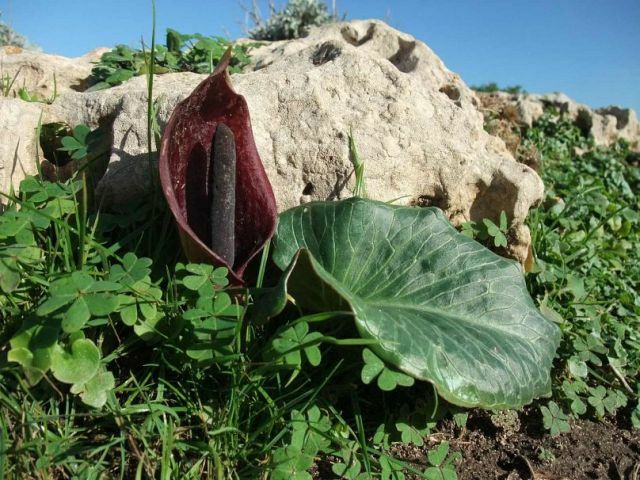 the publication of a purportedly Majorcan endemic, Arum pictum subsp. more the appearance of A. pictum from the easterly part of its range. > (the only one in the genus, apparently). > Does anyone out there have experience with it? > 1034A Virginia Street, Berkeley, California 94710-1853, U.S.A.
Hello Sean, Tony and All! it to the Carolinas, I am definitely planning on visiting. > Arum pictum is superb here and has been hardy so far to 5 degrees F.
>> (the only one in the genus, apparently). >> Does anyone out there have experience with it? >> 1034A Virginia Street, Berkeley, California 94710-1853, U.S.A.
Is Arum pictum the only Arum species blooming in Autumn? I think it is identified correctly. It bloomed in October in Mallorca. Yes,Arum pictum the only one that flowers late summer/autumn (Northernhemisphere), and also the only species that flowers as the leaves emerge. Thenext to flower are generally either A. hygrophilum or A. sintensiii;these can both begin flowering in January, but both flower well after theleaves have emerged. Manythanks for the pdfs you sent a couple of days back. IsArum pictum the only Arum species blooming in Autumn? Ithink it is identified correctly. It bloomed in October in Mallorca. Yes,you're right.Mine are from Corsica and they flowering in september.That is for me the only species with autumn blooming.Like Biarum ditschianum is distinct from others Biarum species with a spring flowering ...something different...always exiting!